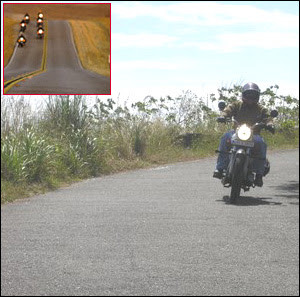 Seriously how many of us really switch our motorbike headlights on while riding in Daytime? Probably the count may rest in both my hands. I never used to switch it on, till I rode with Silver-Bullets on a 2000 km ride (Trivandrum- Goa and back). However I used to use the parking lights on my bullet occasionally. + Am I wasting a 35-rupee bulb? . + Probably a wasteful activity. May look like a fool too! However post ride I felt it was a good and positive act as it helps in visibility of a motorbike rider on a road … especially in Indian traffic where every road with its ups and downs is a mystery unraveled by all drivers/riders who rally everyday! I don’t think we have Daytime Running Lights (DRL) in Indian motorbikes and cars. So we switch on our regular night riding headlights during the day also. I know we may feel a bit awkward switching it on in the city and we have lot of people on the road pointing it out as though we are committing a sin! Small proof for visibility. You will definitely get noticed by 99% of the vehicles coming in the opposite direction. I know there are fuel costs, motorbike costs, bulb costs, and environmental costs involved in this activity.
" DRL as a road safety measure is often difficult to understand for the road user because he or she `knows' that with sufficient attention every road user can be seen in daylight. Nevertheless, the research reviewed shows that visual perception in daytime traffic is far from perfect and it is worse in conditions of low ambient illumination. In a striking example 8% of cars in an open field in broad daylight were not visible from relevant distances without the use of DRL. On shady roads or those with backgrounds which mask objects in the foreground the visibility and contrast of cars in popular colours is greatly reduced. It is known from in-depth accident studies that failing to see another road user in time (or at all) is a contributing factor in 50% of all daytime accidents and for daytime intersection accidents this increases to as much as 80%. " That’s about cars...... – Then we can probably assume that motorbikes will be totally invisible suggesting that we MUST switch headlights on in daytime! I am not advocating mandatory DRL – but for safety sake lets switch our headlights on during daytime. This small act may probably save a lot of trouble for all of us. If the Royal Enfield Bullet is your cake, probably switching on the headlight during daytime riding maybe the "Icing on the cake! " Also hitting the lights indicate that you are overtaking and most often can be misinterupted by oncoming traffic. The reason for why day time lights are used in lands other than india is because of the difference in motorcycle traffic compared to 4 wheelers.but on a long ride with a group, its a mark of identification and also indicates a part of being in a group...but then on a solo ride, it might or might not help.. depending on the kind of roads that a rider is riding through.. I dont know about the new bulls, but on the older ones, even with a 12V electric system, that is a recipe for getting into light problems in the night!